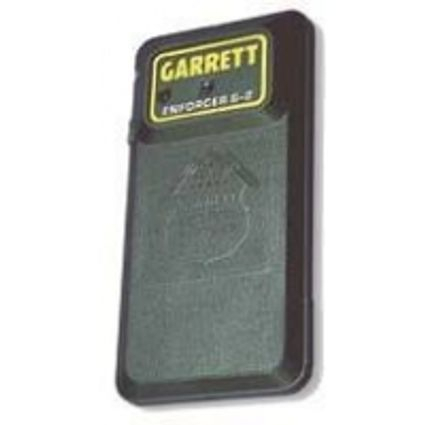 The smallest of all hand-held body scanners, the Garrett Enforcer G-2 features automatic circuitry powerful and sensitive enough to detect all concealed metal weapons, including the smallest knives or guns. It slips easily into a shirt pocket and can be held in the palm of almost any adult hand. This hand-held scanner is designed for use anywhere with a minimum of fuss or bother. The Enforcer G-2 permits immediate searches to be made without touching the person. There is never a need for special personnel — or special places — to use this handy electronic instrument. The Enforcer G-2 Can be used anywhere with a minimum of fuss and bother. Allows effective searches without touching the body. Automatic retuning and battery check.